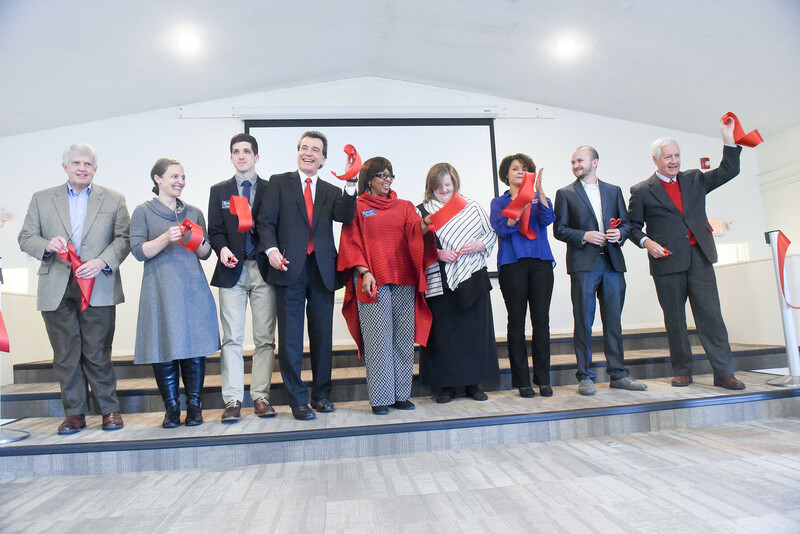 Belmont Ministry Center Ribbon Cutting ceremony at Belmont University in Nashville, Tennessee, January 17, 2018. Following several months of renovations, the new Belmont Ministry Center at 2005 12th Avenue South was dedicated today as part of Belmont University’s campus. The more than 100-year-old building, the former home of the Bass Street Baptist Church which sold the property to the University in 2014, will now be home to numerous worship services and ministry opportunities of the campus. Specifically, the Belmont Ministry Center will become the home for the University’s Room in the Inn Program, which currently involves more than 150 students serving homeless guests every Wednesday and Friday night that classes are in session during the winter months. In addition, the building will be available for more than a dozen Christian Faith Development Organizations to meet for worship services and special events and as a place for students to engage in a wide range of ministries to the community. The renovation of the facility included updated plumbing and electrical work and a new roof as well as new HVAC systems, doors and windows. Fresh paint and new carpet and tile accompanied interior changes that also brought new kitchen appliances, a laundry room and shower to the center. The sanctuary, meeting rooms and fellowship hall of the Belmont Ministry Center will allow students to participate in large and small group worship, Bible study and fellowship, while the kitchen will provide the ability to better serve Room in the Inn guests as well as open up possibilities for student fellowship and special events.